What started as a busy shopping day in the USA, Black Friday has become a consumer extravaganza in countries all over the world. Shopping isn’t for everyone, so we’re having an alternative Black Friday. What’s black in physics? Let’s start with the [scientific] dictionary definition. Pretty straightforward. Or is it? The absence of light or the total absorption of light is extremely useful to scientists, and has a lot of applications. Creating a material that looks black is easy – the device you’re reading this on is probably black. But of course it isn’t totally black, with common ‘black’ objects like asphalt absorbing about 95% of incident visible sunlight. A Hubble image of spiral galaxy NGC 5793. That extra 5% really matters for scientific applications that need the darkest environment possible to eradicate noise and increase sensitivity, as Physics World recently found out in their feature, ‘Fifty shades of black‘. The Hubble Space Telescope is a prime example, as to get crisp images of distant galaxies we need the optics to be as sensitive as possible. But in 1990, the best NASA could manage was a black paint with a reflectivity of 3.5%. Now, thanks to nanotubes we can create materials with a reflectivity of 0.035% – one hundred times ‘blacker’ than NASA’s old paint. Now that is black, and could help with a wide range of applications, from infrared sensors to solar power and apparently, even surgery. Interstellar‘s accretion disc, with and without Doppler shift. Black isn’t just restricted to materials though. If asked ‘what is the blackest thing ever’, many would say a black hole. Well, true, you can’t get much blacker. After all, a black hole is so massive that almost no electromagnetic radiation (light) can escape its gravity. The physics that this implies is the source of a great deal of discussion. Such as, what happens in a black hole? Where does the energy go? What is Hawking radiation? Naturally, we can’t ‘see’ a black hole. It’s black. We instead know of their existence through the physical effects of their great mass, and the presence of an event horizon. The recent movie Interstellar further popularised black holes, and of course the much-posited wormhole. But something set Interstellar apart from other sci-fi films: their black hole is actually quite realistic. Our friends over at Classical and Quantum Gravity delved into this a bit more with the science team behind the film, and learnt about what a black hole would actually look like. Black is everywhere in physics. We’re now seeing ‘electromagnetic black holes‘, the idea of clever metamaterials being able to collect and absorb light from all directions. Another, perhaps more straightforward idea looks at nanomaterials that can absorb a broad range of wavelengths of light. If either of these can be brought to a commercial level, it could revolutionise the energy market. Going beyond black for a moment, there is a huge research effort for broadband electromagnetic absorbers outside of the visible spectrum. Such materials have the potential to be used in advanced military stealth applications (to hide from radar), or in research to shield sensitive components or detectors from external radiation. Scientists seek black for other reasons too, one being aesthetics. When watching television, have you ever noticed that the dark scenes aren’t exactly dark? This is because of backlighting, meaning that a supposedly black screen will often look grey. So, researchers have been developing ways to eliminate the need for a backlight with bright organic LEDs which are also (visually) completely black when needed. Science that improves your Game of Thrones experience can only be good. This is just scratching the surface of uses for black in physics. Whether you use detectors, computing, imaging or astronomy, you can all but guarantee that somewhere it will be beneficial to utilise black. I’ll leave you with one final thought, a theoretical construct which is completely black, but simultaneously not black. 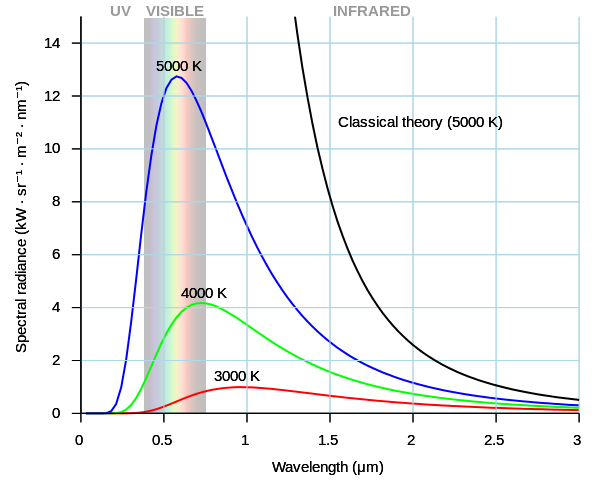 Black body radiation curves. A 5800K blackbody approximates the spectra of our Sun. I’m talking about the idea of a black body, used particularly in space science, but which is useful in anywhere that near-perfect absorption is involved. It’s an idealised physical body which absorbs all electromagnetic radiation, in all wavelengths and angles. However, it is also a perfect diffuse emitter, emitting radiation in a defined way which is affected only by its temperature, all the while remaining in thermal equilibrium. Of course this is not a real object, but we can use the approximation for black holes and stars, and to help us understand how radiation absorbed by objects is then re-emitted. And it works: the blackbody radiation curves for various temperatures (like those in the image) give us a good estimate of the spectra for stars of different temperatures. Top: Hubble spiral galaxy, credit: NASA, ESA, and E. Perlman (Florida Institute of Technology). Middle: Figure 15 a, c from “Gravitational lensing by spinning black holes in astrophysics, and in the movie Interstellar” From Oliver James et al 2015 Class. Quantum Grav. 32 065001. CC-BY. Bottom: Black body radiation curve. Credit: Darth Kule, reused from Wikipedia.